I have a lot of plants to attract butterflies, but buddleia bushes are by far their favorite. They even jostle one another for prime buds. I wonder why. 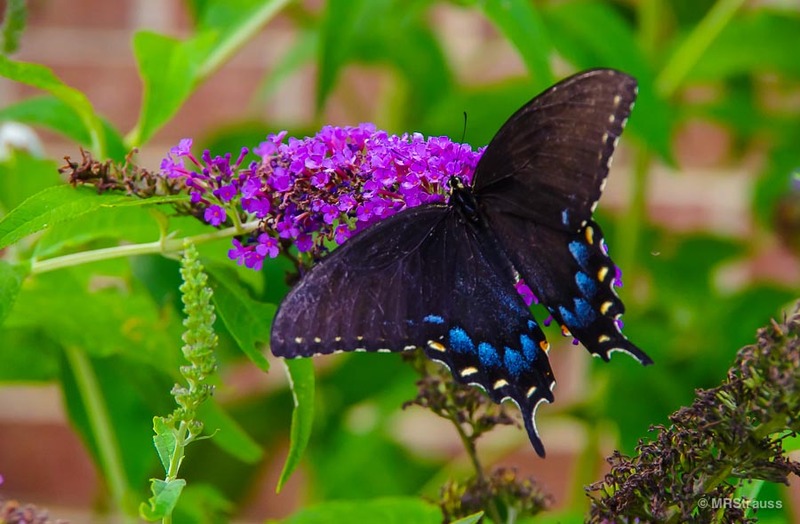 Is buddleia the chocolate of the butterfly world? I tried tasting one of the flowers but I guess my palate isn’t sensitive enough. 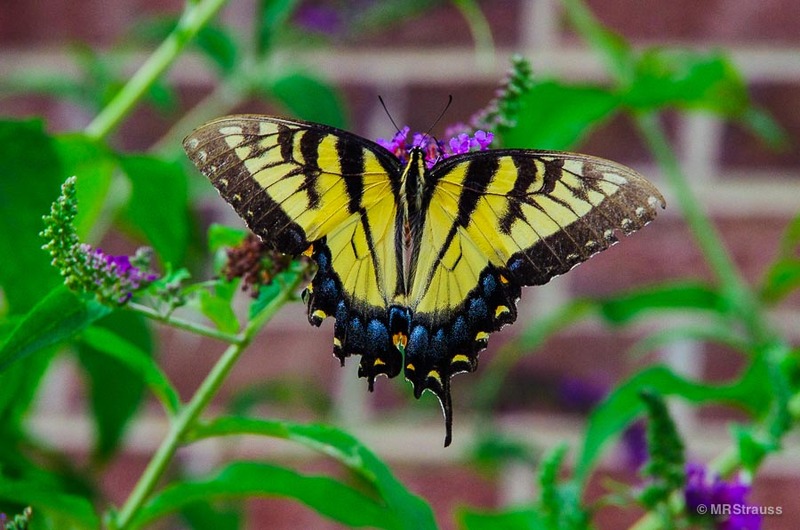 This entry was posted in Image, Sustenance and tagged Black Swallowtail, Yellow Swallowtail on July 20, 2013 by mrstrauss. When I woke up I knew something was horribly wrong. I lie there in my bed looking at the yellowed plastic window shade flapping and making a thwacking sound; then it would get sucked onto the screen, then it was flapping again. I ran out onto the porch and saw the sky covered with grey clouds, completely covered. They were thick like the cotton padding in the first aid kit and they were moving super fast. I looked out to the ocean; it was dark grey, but not the metal kind of grey— more like grey mud. There were no waves; the sea was just kind of rolling and it looked like it was up way higher than it usually is. That’s when I knew a tidal wave was going to hit really soon and wash everything away. I had just seen a show about tidal waves, so I felt pretty sure I knew what to look for. I ran to tell my mom in the kitchen, but she said we were not going to be hit with a tidal wave because we don’t have tidal waves here. She’s really gonna be sorry. I ran downstairs to my friend Sheila’s apartment to warn her since they are on the first floor of our apartment building and they are sure to be in much more danger, but she wasn’t home. Maybe they already knew and went somewhere safe so I ran back upstairs. I decided I really needed to get ready for this. I searched the whole apartment before I saw my pink plastic bathtub from when I was a baby. It was filled with toys which I quickly dumped out. I could still fit in it with some room for supplies if I sat with my legs tucked up. I decided I would put it on the porch so that when the wave came, I could float out on it; I didn’t want to get stuck and drown in the apartment. Now I had to get what I needed in my boat quickly. I decided to pack a change of clothes, underwear and an undershirt. I could wear my raincoat and boots and hold the see-through bubble umbrella Aunt Jean got me that was my favorite thing next to my Barbie Dreamhouse. I decided on some band aids, since they don’t take up much room, one row of Ritz crackers, a grape Little Hug, a can of tuna, and a fruit pie, which I didn’t really like (we didn’t have any Yodels). I also took one Barbie doll— which took me forever to decide on and then which outfit she should wear. I didn’t have a raincoat for her, but I had a kind of short shiny pink jacket and some little white boots. This was about all I could fit with me in my boat. I was ready. I sat in my boat and waited; I put is so I could see the ocean through the rails on the porch. I waited a really long time, so I ate some of the crackers and drank a little bit of my juice. Then it started to rain; the wind was blowing the rain onto the porch and it was getting kind of hard to keep my eyes open with the rain heading right into my face. I decided to bring the boat inside but keep it really close to the porch door so I could get out quickly. I stood there for awhile, but I got kind of tired so I decided to sit on the sofa and draw for a bit. I could still kind of see the ocean and keep an eye on it. My mother came out from the kitchen to tell me that she heard on the weather that we were not going to have a tidal wave today, just rain and wind. I didn’t believe her; grown-ups always lie, always— and she would never tell me if something like this was going to happen anyways. I waited and waited. I got so tired that I had to go to sleep. I tried to see if I could sleep in the boat, but only my legs fell asleep and got pins and needles; then I decided to lay on a blanket next to the boat, but the floor was super hard so I went to my bed. I decided to keep my boat next to my bed just in case. When I woke up it was dark, I was hungry so I ate the rest of the Ritz crackers and finished the grape juice. Even though this was a long time ago and I’m all grown up now, a small part of me always feels like the tidal wave is still coming. This entry was posted in Narrative and tagged Childhood Memories, Doomsday Preppers, Tidal Wave on July 9, 2013 by mrstrauss.